Effect: This monster can only be special summoned by selecting one Gradius on your side of the field. The ATK and DEF of this card are always applied to the ATK and DEF of the selected Gradius. 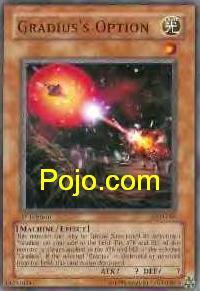 If the selected Gradius is destroyed or removed from the field, this card is also destroyed. If any of you are planning to do some kind of fun Gradius deck, this would fit perfectly. There was a game created a while back called Gradius and I'm guessing Konami is paying tribute to that game by creating these cards that revolve around Gradius. Since this monster will always have the same ATK as the Gradius, it's very easy to get an extremely powerful force on the field. For example, summon a Gradius, play maybe one or 2 of these options, and then use United We Stand on the Gradius. With just 4 cards, you have 3 monsters with an attack power of 3600 each, easily killing the opponent in 1 hit. I suppose it would be very possible to create a competitive Gradius deck with these cards. I'd give this card a 4/5 in a gradius deck. It's really more for casual play than anything you would want to use in a tournament. Let me start this off by asking why would anyone want to play Gradius in the first place? Along with this Monster, they are both terrible cards. Maybe a casual Gradius swarm deck would be somewhat fun. But, all your opponent has to do to counter it is to play a simple Torrential Tribute/Dark Hole/Raigeki and you're done. Chances are you won't be holding any cards in your hand either, since you most of your cards were Summoned and Special Summoned onto the Field. Gradius' Option is much to easy to counteract. I chose this one for one reason… I don’t think I quite understand the effect and I was hoping that one of the other reviewers might clear it up for us. As such, I will neither review nor grade this card. No, I will grade this card. In accordance with its attack and defense, I give it. ?/5 ;) – have a good summer, folks. Gradius was one of or maybe the very first Konami video game released so they thought it to be funny/cool to make it into a Yu-Gi monster card, good idea, but bad stats for a card. Sure they’ve released cards that go with it, and are releasing and maybe making more but the only two English ones out now are Cyclone Laser and Gradius' Option. Option lets you special summon another cloned Gradius onto the field as long as one is already, and then shares stats with it, meaning if the real Gradius on the field gets a power boost then Gradius' Option gets the same, but if the original Gradius is destroyed for any reason so is Gradius' Option. I really didn't see to much of a point to this card for a while but if you get a Gradius on the field, maybe even with Cyclone Laser or two, then play a couple Gradius' Option, which you can do all in one turn since Options' a Special Summon, then you can actually do a bit of damage. Not too much though. Gradius is only 1200 ATK + Cyclone Laser boosts 300 ATK but adds trample effect (doing damage when attacking monsters are in defense) + Gradius' Option = A couple spearing 1500/1800 Atk machines that can attack under Gravity Bind. At most you could use Limiter Removal and do a Suicide run, but until machine decks become big this card won't see much play, so at the moment Gradius' Option is very optional.